The DC-1004 program helps you design and compare bullet flight performance, while also calculating the maximum vertical height to which the bullet rises with a given muzzle velocity, and the terminal energy and velocity of the same bullet when it strikes the ground. The program asks you for the caliber, bullet weight, and ogive shape, as well as the meplat (nose width at the tip). It allows you to enter various media densities, such as dry air at sea level or any other combination of moisture and elevation as expressed in air density, so you can compare the performance at different elevations, barometric pressures, and with different humidity levels. The program lets you tailor the sampling rate for the reiterative air resistance calculations, from 0.001 seconds to 0.1 seconds, to trade calculation speed for higher graphic resolution. A graph with the y-axis equal to velocity, and the x-axis equal to time of flight, is produced for your bullet design, and can be viewed or printed with or without specific figures for any given point on the graph. The display of detailed parameters can be removed from the graph by clicking anywhere within the blank space of the answer box, in case the graph line should be partly covered by the answer box. The maximum y-axis height can be entered, to change the part of the graph displayed or zoom in on a portion of the curve. The point at which the measurements are taken, in terms of time of flight, can also be selected. Answers include the maximum height of the bullet, the BC, Ingall's number (form factor), kinetic energy and velocity of the bullet at the point of measurement, the total time of flight to reach zero velocity, and the drop figures of terminal velocity, terminal energy, and drop time. These drop figures are those which result from dropping the bullet from its maximum vertical height, which in turn depends partly on the initial velocity, BC, and air density. The DC-1004 Terminal Plotter uses a different approach to calculating drag and BC, in that the figures are recalculated at the sampling rate desired from 1 to 100 milliseconds, starting with the last velocity and reducing it by the acceleration of gravity for the sampling time period, then applying the G2 ballistic calculations for the physical parameters of the bullet adjusted for the new starting velocity and air density. The ending velocity is then used as the starting velocity for the next loop of calculations, in a dynamic calculus of the air resistance and resulting BC. The BC then figures into the retardation of the bullet, and is updated in the next sampling. The program provides a drop down chart of various air densities for dry air at different temperatures, and other gasses such as nitrogen, liquids (water), and solids (ice, ballistic media, wax). Detailed help for the drop down chart and a pop-up window for the sampling interval entry assist the user in understanding the effect of his choices on the answers and the graph. Using the DC-1004 program as a graphic comparison tool for various bullet designs enables the bullet maker to show clients exactly what differences may occur as a result of subtle design differences. The program also lets the user select distance in yards or feet, and the kind of base design can be selected and changed instantly from flat to boattail to rebated boattail. A fourth choice is the ULD option, which means ultra low drag design. Clicking this button changes the ogive curve and the tip or meplat as well as the base to conform to Corbin's ULD standard. This gives you a fast way to compare the highest efficiency bullet shape in any weight and caliber with the standard shapes, or any other shapes you wish to compare. 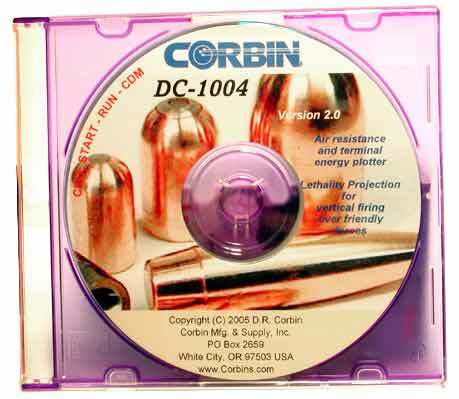 DC-1004 may be purchased from the Corbin secure server shopping cart with your Visa or Master Card.